That’s quite a recommendation from somebody whose opinion I massively respect, it sounded right up my street so whilst I was (almost) in the area I just had to visit. It almost ended in tears as after a fairly long drive we arrived to find that they were almost full, they were refusing to let the man in front have a larger table which I misheard at first and thought they were turning him away completely which would obviously have meant no room for us either. Luckily we got the last table in the place, phew. For starters we ordered crab cakes with thai dressing and ‘Angels On Horseback’ which are grilled oysters, wrapped in bacon served on toast. The crab cakes were good, light and flavourful and the thai dressing was sweet with a little heat. The Angels On Horseback were a delight, i’m ashamed to say that despite trying to be and wanting to be i’m just not a huge oyster fan but these were amazing. Obviously wrapping anything in bacon will make it taste good but the oysters themselves were very tasty, much better lightly grilled than raw for me. 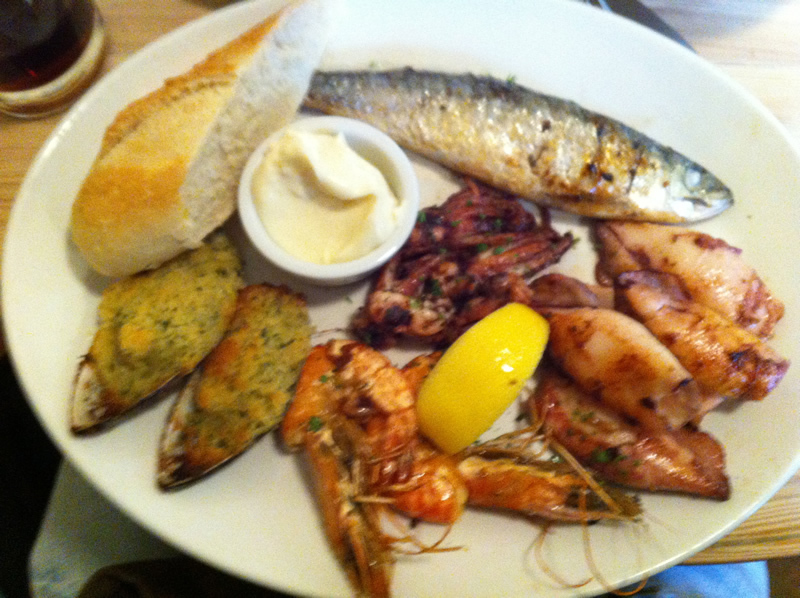 Next we ordered the Grilled Platter which contained grilled mussels topped in breadcrumbs and herbs, sardines, prawns & squid. Everything was cooked to perfection and as Jamie said is just so simple and humble. All except the mussels which in my opinion the topping completely takes over the flavour of the mussel itself. Other than that it was a perfect plate of seafood. Served with loverly fresh soft bread, butter, mayo & lemon. Simple and delicious. 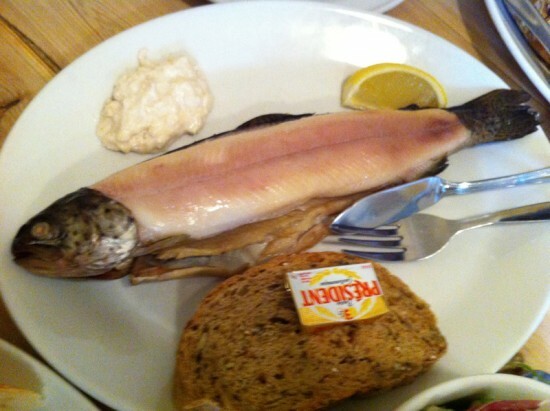 We also ordered Smoked Trout with Horseradish sauce. The trout was fantastic, cold smoked with an incredible deep flavour. The horseradish sauce was really strong, too strong on it’s own in fact but it worked perfectly with the fish. A fantastic dish. Desserts were also very good, I ordered a Treacle Tart (after checking that it was made with golden syrup of course), it was sticky, sweet and loverly. It was my partners dessert that stole the show though a ‘Hot Lemon Cake’ which was a delight. So light and airy with a delicate lemon flavour, it reminded me a little of Heston’s Tipsy Cake at ‘Dinner‘ which is a pretty huge compliment. 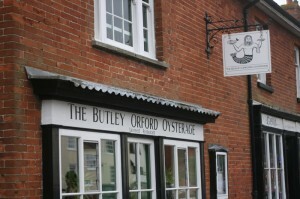 Service was a little slow due to how busy they were but the staff were clearly trying their best and were very friendly. Perhaps it’s a little expensive but then again everything is so fresh and good quality I believe that it is worth it. I’m not sure that I will be in the area again anytime soon but if I ever am I will certainly be back for more. Highly recommended for lovers of seafood.